Very few of you knew that we’ve been “secretly” working on a report dedicated to the insider threat – for the last year or so. We had a few false starts [because, frankly, we could not find anybody who actually cared about the problem :-)], but we finally did it!! 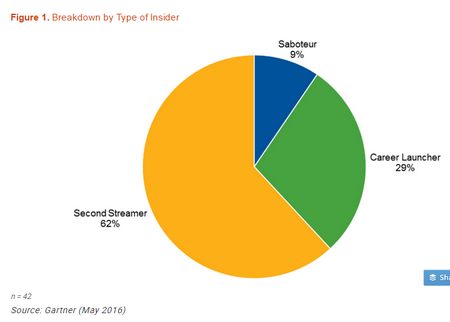 Specifically, “When we look at only the incidents that involved second streamers, it becomes clear that their primary interest was profiting from the sale of business or trade secrets.” <- we mapped insider types to their goals and targets. “We found that 55% of the respondents to this survey have some insider threat controls in place, but only 18% have a formal [counter-insider] program in place.” <- a key point: these are percentages of people WHO AGREED TO HELP WITH AN INSIDER THREAT SURVEY, NOT (stressing it again – N-O-T!) some general population. Selection bias! “Many organizations implement controls to reduce or mitigate insider threats through business processes [not some ‘IT security appliances’]” BUT “66% indicated that IT was responsible for managing insider threat programs for their organizations” <- a paradox here? “Many organizations went for “two for one” — employee education (both upon hire and ongoing, as well as “on the spot” in case of a violation) and employee monitoring, in line with Gartner PCS recommendations.” <- this is a glimpse of ‘controls that work’ sections of the report. More blog posts from Erik and me on this report are coming! We have a lot of juicy data on insider threat spend, capability maturity, controls that work, incident types, detection effectiveness, etc – much awesomeness here. So, go and enjoy the report! Insider Threat: Does It Matter Now? And How Much?